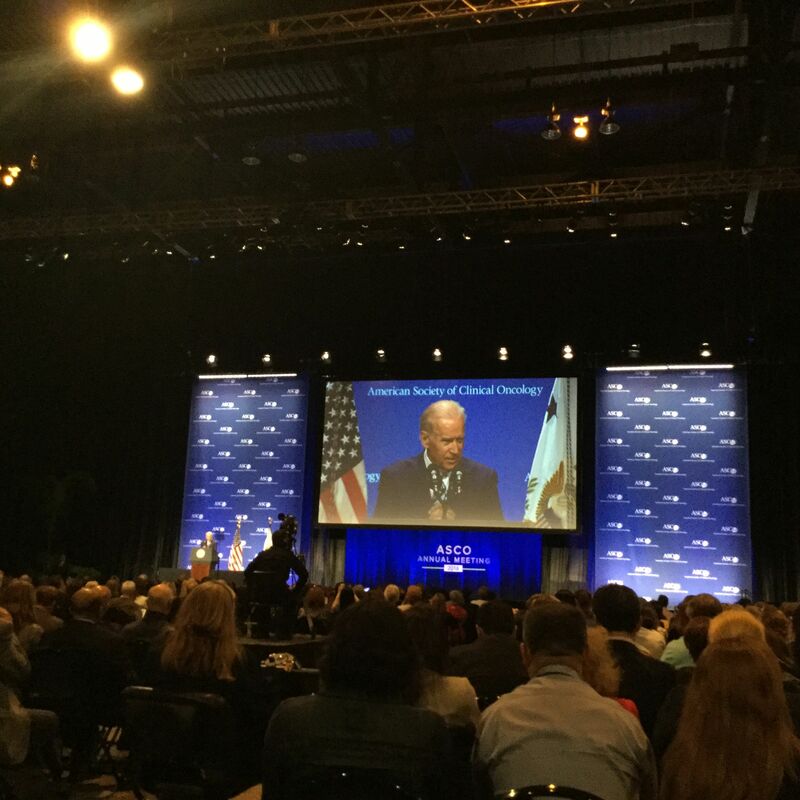 Speaking from the heart, Vice President Joseph Biden addressed thousands of cancer researchers today in a packed hall at the American Society of Clinical Oncology (#ASCO16) annual meeting in Chicago, to tout his Cancer Moonshot initiative. The theme of this year’s #ASCO16 meeting, “Collective Wisdom – The Future of Patient-Centered Care and Research,” is perfectly aligned with the goals of the Moonshot, Biden told the rapt audience. The ASCO theme and Biden’s Moonshot are also perfectly aligned with LLS’s goals, as we strive to bring about a world without cancer, and help make someday, today, for the 1.2 million Americans living with a blood cancer. He said that every year “new breakthroughs, new promise and hope” emerge from the ASCO meeting. But he said no single researcher can do it alone, which is why a key focus of the Moonshot is collaboration – bringing multidisciplinary teams together to work on the common problem of finding cures. To support this concept of collaboration, Biden also announced the launch of a public genomic and clinical data sharing portal – the NCI Genomics Data Commons, a $20 million platform to give researchers easy access to data to help move discoveries forward faster. Biden said from this point forward all NCI funded clinical trial data will be stored in this new portal, which will start with the data from 12,000 cancer patients with more to follow. The vice president noted that “Cancer is the only bipartisan thing left in America right now,” a fact borne out by a recent survey LLS conducted about Americans’ views on cancer research and the Moonshot. In our survey, both Democrats and Republicans strongly support the need to invest more in research. “I am committed to bringing together all the human, financial and knowledge resources to seize this moment,” the vice president said. He added that we need to create a system that rewards team science and also one in which more patients are eligible and able to participate in clinical trials.